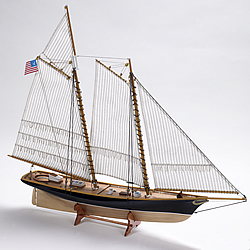 Billings Boats BIL609 America 1/72 scale wood ship kit! 1851 – Answering a challenge from the Royal Yacht Squadron, the schooner America enters the Hundred Guinea Cup race, a 53-mile race around the Isle of Wight. It easily defeats the 14 British ships and is awarded the Hundred Guinea Cup. On August 25, Queen Victoria herself visits the ship. America returns home and presents the New York Yacht Club with its prize, which is renamed America’s Cup.